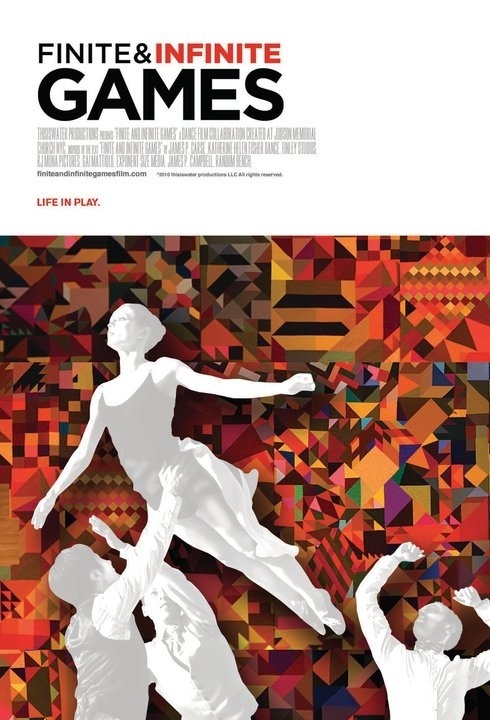 Recently, I viewed an advance copy of a collaborative art film titled, Finite and Infinite Games. It is stunning; visually rich with color, architecture, and movement. I was specifically curious about the manner in which this film brought individual voices, from New York, LA, and Italy, together to form a cohesive whole. "Sometimes the most courageous thing you can do is ask," states Katherine Fisher, artistic director and choreographer for the project. This work is described as a collaborative, interdisciplinary project melding the contemporary visions of a choreographer, a filmmaker, a visual artist, and a fashion designer. Ms. Fisher, a graduate of the NYU Tisch School of the Arts, has danced with Momix, Mark Morris, and currently works with Lucinda Childs. Finite and Infinite Games is her first film, and she gathered a brilliant team of artists to create and execute her vision. The press release for the film states that the piece is based loosely on a philosophical text by James Carse and 'seeks to explore the individual's quest to find purpose in life through creation within community.' The following is a behind the scenes look at this process as told by some of the collaborators. Judson Church, which serves as a setting for the piece, contextualizes this spirit of team work that is apparent in Games. The church, on the south side of Washington Square in Greenwich Village, has served as the incubator for many of the most celebrated names in Contemporary dance and art. Merce Cunningham, Twyla Tharp, Trisha Brown, and Andy Warhol are but a few of the many artists who worked and grew at Judson Church. I asked executive director and president of thisiswater Productions, Michael Robinson, what interested him in the project. "The mission of my personal work is to develop a film library of high caliber dance films. To put contemporary choreography on film with Hollywood standards. We have such a beautiful product: amazing choreography, sensational art, and Gai Mattiolo's fashions are out of this world. With that combination, all we needed was a camera to point and shoot. This project has surpassed all my expectations." This was Robinson's first film project as well, and he is quick to admit he learned as the process unfolded. But with Games finished, Mr. Robinson is already on to his next film, a reconstruction of Mandala XIII by the late choreographer, Murray Spalding. I asked visual artist, C. Finley what she learned from this project. "One of the biggest challenges was time. Mike Robinson, the Executive Producer, cut us a check over dinner. From that moment, we created and finished everything in three months. Although every one of the collaborators involved had been working in their individual fields for years in preparation for a project like this, we created the concept, started thisiswater Productions LLC, held auditions, selected music, created and rehearsed material, worked with a fashion designer, found a film maker and crew, designed and executed a 50'x12' painting, and secured Judson Memorial Church in a compressed amount of time. The entire project was filmed in three, fourteen-hour days. I learned that I could make a 50'x12' painting in six weeks exactly, with the help of one amazing assistant." "at the end of the day, Kate's work became something I believed in so passionately that I knew I would do whatever it took to share and embody her art. The dancers were such excellent people... Their good energy kept me in a positive place." See the work for yourself December 14th (8 PM) and 15th (7:30 PM) at Judson Church in New York City. The film will be accompanied by a live performance of the piece. This article is the continuation of an on-going exploration of choices and opportunities we have to better understand and participate in: health, art, education, and our communities. I look forward to continuing the conversation.